Living a Fit and Full Life: Bundle Organics Organic Lactation Support Tea is a Miracle for Nursing Moms with Low Supply! 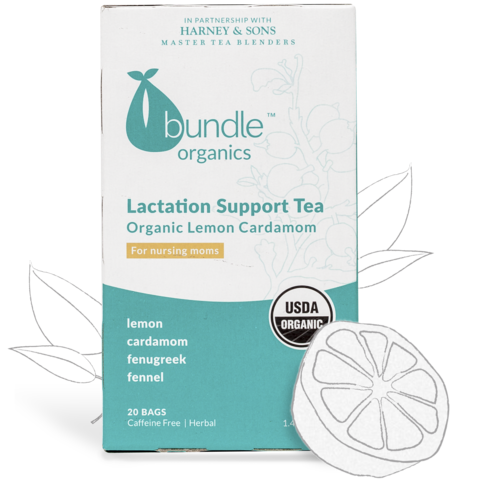 Bundle Organics Organic Lactation Support Tea is a Miracle for Nursing Moms with Low Supply! We get it – the moment you found out you were having a baby your brain kicked into overdrive. Suddenly you’re no longer dining for one and everything you put in your body matters. The questions never stop. How much broccoli is too much? Is it safe to eat an entire watermelon? Will your baby inherit your great uncle’s ears? It can be a confusing time. Have no fear, we’re here to help (with the nutrition part… good luck with the ear thing!). Bundle Organics juices are packed with quality, organic fruits and veggies (we are extremely picky produce people) with an extra bump of vitamins and minerals essential for healthy prenatal development. Best of all, we’ve done all of the research and checked all of the boxes so you don’t have to. And – you might have to sit down for this – it actually tastes good. Really, you’ll want to drink it even after your little bundle of joy arrives. And why not? Folic acid, calcium, iron, and all the nutrients we have in our juices are good for pre-conception and breastfeeding too! So sit back in that rocking chair, relax and sip happy. Our naturally caffeine-free Organic Lemon Cardamom Tea is blended with nursing moms in mind. Ingredients like fenugreek, fennel, thistle, and coconut have been traditionally used to help increase milk supply, while ginger and cardamom add a subtle spice. It’s the perfect cup to reach for whenever you need a boost - morning, noon, or night. Tastes like: Light and soothing with nutty notes, and a gentle splash of lemon and spice. Bundle Organics teas are blended by esteemed tea merchants Harney & Sons to provide expecting and new moms a nourishing, flavorful and tranquil tea-drinking experience. Our unique pregnancy blends are thoughtfully designed with whole- food based, OBGYN-approved ingredients to address moms’ needs during all stages of pregnancy. Our lactation blend is designed with ingredients that help support healthy lactation so that you can get back to connecting with baby. Go ahead. Sip away. Also be sure to check out their Nausea Relief & Pregnancy Wellness Teas! Bundle Organics Organic Lactation Support Tea is a Miracle for Nursing Moms with Low Supply! My son is a year and I plan on nursing till he's at least two but that has required some help from Bundle Organics Organic Lactation Support Tea. Since I'm a runner I often have a low supply after long runs so having a Lactation Support Tea to help is wonderful. I was completely blown away at how much Bundle Organics Organic Lactation Support Tea has helped. I can now plan my long runs and drink the Lactation Support Tea to help increase my supply. Nursing has it's challenges but don't let having a low supply be one of them. I also have to add that I really enjoy the flavor of this Lactation Support Tea and found it to be the perfect way to enjoy a few relaxing moments throughout the day. Click HERE to locate a store near you that sells Bundle Organics! Click HERE to learn more about Bundle Organics! Follow Bundle Organics on social media!